The air ambulance has landed in Peterborough this morning following an industrial accident at a city firm which left a man with serious leg injuries. Police, ambulance crews and the East Anglian Air Ambulance are at the scene at the junction of Fengate and Nursery Lane. Police have confirmed that an industrial accident has taken place and the air ambulance has landed at Peterborough Driving Test Centre nearby. A spokesman for the East of England Ambulance Service said: “We were called at just before 9am today to Fengate, Peterborough, to a report of an industrial accident. “An ambulance officer, rapid response vehicle, ambulance crew and East Anglian Air Ambulance were dispatched. 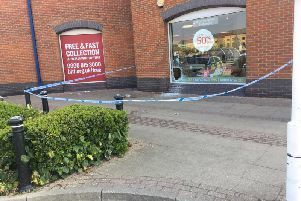 “They treated a man, believed to be in his 60s, who had suffered a leg injury. “He was treated at the scene and taken to Peterborough City Hospital by land ambulance for further care.